Lamb offal and beef fat mixed with oats and spices. 10 mins. Scotland's most loved haggis. 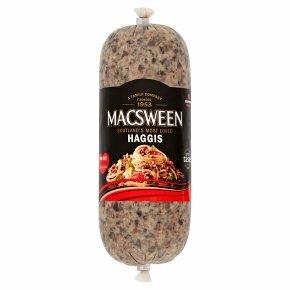 Out of 170 participants, 132 rated Macsween Original Recipe Haggis as their favourite! Independent Blind taste panel, July 2017. Remove printed packaging. Wrap the haggis in foil, place in an oven-proof dish with about 2cm of water and heat at 180ºC (gas mark 4) for 75 minutes. Remove casing and clips before serving. (800W category E)Remove printed packaging, casing and clips. Cut into pieces and place in a microwave dish. Cover and heat on 'medium' for 10 minutes, stirring once during cooking and once before serving. Microwave ovens vary; adjust times accordingly. Guide only.Your haggis requires heating until piping hot. Defrost first if frozen. Consume within 24 hours of opening.